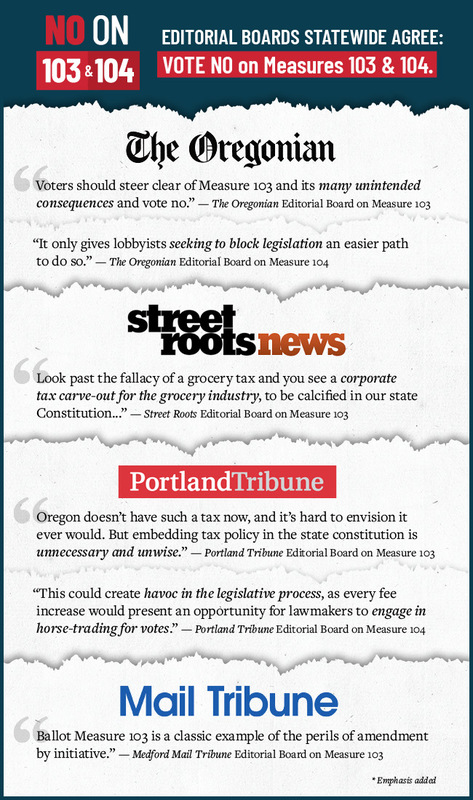 The Oregonian, Street Roots, Portland Tribune and Medford Mail Tribune all urge a “no” vote on Measures 103 & 104. See what they have to say about these unnecessary, misleading and risky constitutional amendments. 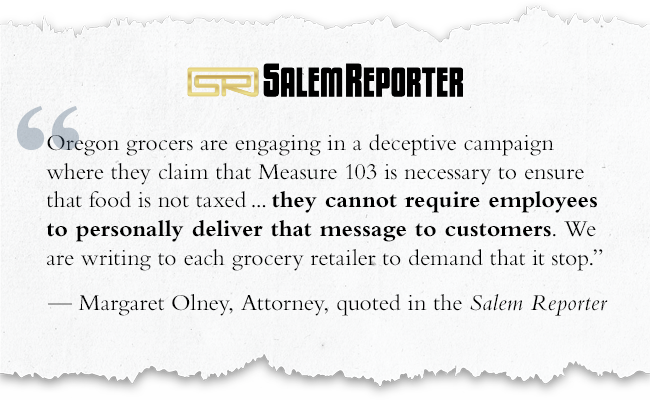 Over the past two weeks, we have heard reports across Oregon about retail stores requiring clerks and customer service employees to hand out pro-Measure 103 magnets and fliers. Just today, the Salem Reporter broke the story. This political bullying is not just wrong, it’s illegal. In Oregon, employers like grocery stores cannot require their employees to engage in political communications on their behalf while on the job or else face discipline. The special interests behind Measure 103 have gone too far, apparently requiring employees to hand out the flyers. It’s a clear attempt to scare customers with misleading information. The truth is that there is no tax on groceries, and nobody is proposing one. Measure 103 is a brazen attempt to permanently carve out loopholes for slaughterhouses, trucking companies, and fast food chains, while doing absolutely nothing to make groceries more affordable. We’re standing up to this latest attack from the special interests bankrolling Measure 103 to say no to political bullying. If you agree that Oregon workers, customers, and families deserve better than misleading campaigning in the checkout aisle, make your voice heard today! Pledge to vote no on Measures 103, 104, 105 & 106. PORTLAND — Three former Oregon Secretaries of State released a statement today urging the current Secretary of State and his administration to review whether or not Initiative Petition 31 should be certified for the November ballot. Initiative Petition 31 has been dogged by serious allegations of rampant signature gathering fraud, including a whistleblower’s firsthand account and more evidence gathered during the signature verification observation process. The potential problems include: Registered circulators attesting they witnessed sheets that they did not collect, unregistered paid gatherers circulating paid petition sheets, and shockingly high daily totals for many signature gatherers. Despite these credible allegations, the Secretary of State’s office certified Initiative Petition 31 for the ballot last week. The office has until August 5 to study and potentially reverse that decision. “The integrity of our elections is the cornerstone of our democracy. Oregonians need to be able to trust that the candidates and issues they are being asked to consider have made it to the ballot in a fair, honest and lawful way. As former Secretaries of State, our job was to safeguard Oregon’s democracy. Recently, serious allegations of fraud have been brought to light regarding the signature gathering process to qualify Initiative Petition 31 for the November 2018 ballot. We trust that the Secretary of State will conduct a thorough investigation. We are concerned, however, that the Secretary has announced that they have verified and qualified the measure for the ballot even though there is an open fraud investigation. We cannot risk any measure making it to the ballot as a result of fraudulent and illegal practices. It would weaken voters trust in the system and could impact their decision to exercise their right to participate. The Secretary of State has the power and responsibility to enforce election laws and make sure that initiatives do not reach the ballot through fraud. In the past, we’ve used that authority to hold signature gathering campaigns accountable. When presented with allegations of fraud and abuse, we’ve taken those allegations seriously, investigated, and prevented illegally operated measures from ever reaching the ballot. We knew that taking this action was essential for ensuring that Oregonians have trust and confidence in our elections. Even though the Secretary of State’s office has said they’ve completed verification of Initiative Petition 31, the Oregon Constitution allows until August 5th for the Secretary of State to review whether or not a measure should be certified for the ballot. The Secretary of State can complete that review even after signature verification is complete. The content of the measure is not, nor should it be, an issue when considering a place on the Oregon Ballot. The issue is the legality of the process used to earn the right to ballot placement. That legality for IP 31 is a serious question that requires a completed investigation. New and troubling whistleblower allegations about signature gathering practices on Initiative Petition 31, the special interest-backed attack on Oregon’s constitution, recently came to light. It appears the signature gathering firm working on IP 31 had paid circulators fraudulently to sign sheets that they did not collect and allowed unregistered paid circulators to circulate petitions. If true, potentially thousands of signatures were illegally collected. Late last week, the Oregon Attorney General’s office opened a criminal investigation into the whistleblower’s allegations. The same firm that gathered signatures for IP 31, Ballot Access LLC, acknowledged earlier this year that at least one of its signature gatherers was lying about anti-immigrant Initiative Petition 22. Signature gatherers were falsely telling Oregonians that the measure would protect Oregon’s immigrant communities, when the exact opposite is true. The Oregon Attorney General’s office has an open criminal investigation into these complaints. Despite these alarming fraud allegations, the Oregon Secretary of State’s office has refused to stop verifying IP 31, IP 22, and IP 1. It doesn’t have to be this way: The Secretary of State’s office and Elections Director Steve Trout have until August 5 to investigate these concerning fraud allegations and decide whether these measures should be certified with the ballot. But in a recent story, Trout was adamant that his office will not be seriously investigating these claims to see if the law was broken. We need your help to stop what could be the largest signature gathering fraud scheme in Oregon since Bill Sizemore’s notorious days of deceit and forgery. We have to act quickly. If we don’t, Oregon could return to a time when signature gatherers illegally qualified measures for the ballot. Contact the Secretary of State’s office below to keep our ballot free of fraud! We need your help: Contact the elections office today and tell them that the integrity of Oregon’s ballot is at stake. This year, the Southern Poverty Law Center released a report highlighting Oregon’s history of hate speech and intolerance. Now more than ever, our leaders need to reaffirm their commitment to keeping Oregon a welcoming place — but the Oregon GOP is doing the exact opposite. Twice this year already, Oregon Republicans have doubled down on bringing hate speech to our state. Just last week, the Deschutes County GOP hosted John Guandolo, “a right wing extremist, anti-Muslim, disgraced FBI agent and well-known conspiracist.” And just last month, Sheriff David Clarke headlined the Oregon Liberty Alliance’s 2018 Freedom Rally, despite his history of toxic, racist rhetoric. It’s clear that these aren’t isolated incidents. The Oregon GOP just hosted the Dorchester Conference, the largest gathering of political conservatives in Oregon each year — and their speakers list clearly shows that the Oregon GOP is siding with bigotry and hate speech. This year’s conference featured a speech and book signing by Kevin Jackson, a known conspiracy theorist who has claimed that “having a white Republican president is what’s best for the country.” And headlining the conference was Roger Stone, a longtime Donald Trump ally and Republican agitator who has built a career on virulent hate speech against women, communities of color, and LGBTQ people. His disturbing and violent statements have gotten him banned from major cable news networks, including CNN and MSNBC. In fact, Stone was even banned from Twitter, a platform that’s come under fire for refusing to take action against white supremacists and self-identified Neo-Nazis. Roger Stone showed his true colors at the conference by joining members of the SPLC-designated hate group the Proud Boys in Salem. The Proud Boys are self-described “western chauvinists,” known for violence and spreading hate about women and communities of color. The Oregon GOP has shown that it’s fundamentally opposed to our state’s progressive values, and it’s time to send a clear message that their party’s hate speech isn’t welcome here. Together, we can guarantee healthcare for every Oregon kid and hundreds of thousands of our friends and neighbors. Vote yes on Measure 101. We believe that all Oregonians should be able to access care that they can afford. No child should get sick because their family can’t afford the medicine that they need, and nobody should end up in an emergency because a doctor’s appointment was too expensive. Measure 101 secures billions in federal funding to protect care for 350,000 Oregonians and reduce premiums for another 200,000. With it, we can make sure that 95 percent of Oregonians and all children have the healthcare coverage that they need. Pledge to vote yes on Measure 101 in January to keep Oregon healthy. When the Senate failed to repeal the Affordable Care Act last week, millions of Americans breathed a sigh of relief. But here in Oregon, the threat is far from over: Rep. Julie Parrish and local Republicans are attempting to rollback the Oregon Healthcare Protections Bill, which safeguards coverage for 350,000 low-income Oregonians and reduces premiums for another 220,000. 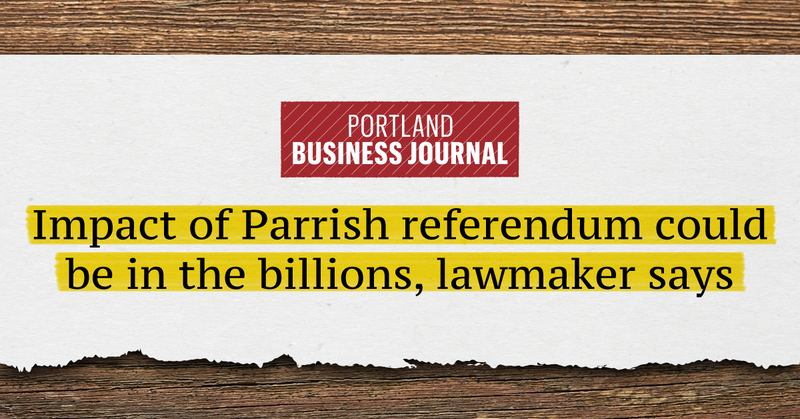 We knew Parrish’s Referendum 301 was bad, but a Portland Business Journal story just showed that it’s even worse than we feared. Not only would the referendum eliminate more than $300 million in state funding, but billions in matching federal dollars that Oregon uses to cover its Medicaid population would also disappear. Just how much are we talking about? According to the Portland Business Journal story, anywhere from $1 billion to $5 billion. The referendum to repeal new health provider taxes— should it both go on the ballot and pass — could have a bigger impact on the Oregon Health Plan than first meets the eye. While just cutting the taxes would reduce state revenue by $333 million, the total loss could be anywhere from $1.3 billion to $5.2 billion because of the elimination of federal matching funds, according to various estimates. With billions in healthcare funding on the line, it’s clear that Referendum 301 would devastate Oregon families. But it doesn’t have to be that way: If Republicans drop this attack, Oregon can continue leading the way on healthcare. Just this week, the Huffington Post took note of the smart healthcare policies the legislature passed this session: expanding reproductive care coverage, ensuring all children have healthcare access, and protecting Medicaid for hundreds of thousands of families. The state’s lawmakers there just wrapped up their legislative session and passed health care laws that fly in the face of what is happening in the nation’s capital. While Congress was threatening people’s health care, Oregon passed a law that gives coverage to just about everyone, regardless of income level, citizenship status, gender identity or type of insurance. The local GOP has a choice: Oregon can either make headlines for taking healthcare away from hundreds of thousands, or for improving healthcare access and protecting families. The choice is clear.